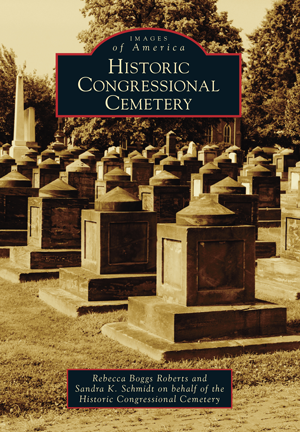 Historic Congressional Cemetery dates from the days when Washington, DC, was a new city on the edge of a malarial swamp. The stones—sandstone tablets with colonial calligraphy, ornate Victorian statues, 20th-century art nouveau carvings, and contemporary markers in shapes as strange as picnic tables and upended cubes—are a time line of the city. The most distinctive stones are 171 cenotaphs; large cubes designed by Capitol architect Benjamin Henry Latrobe from the same sandstone used in the Capitol. They are found nowhere else. The men and women buried under those stones led lives of beauty, courage, struggle, cunning, leadership, and humor—in short, the stories of American history. Sandra K. Schmidt has been researching the history of the cemetery for almost 20 years. She has collected biographical information for over 20,000 of the individuals interred there, and she built the first Congressional Cemetery website to make that information available to the public. As the cemetery's program director, Rebecca Boggs Roberts turns those stories into tours and events. Tours include Uppity Women: HCC's Suffragists, Sinners and Scoundrels, Lincoln's Last Day, and Last Call: Prohibition in Congressional Cemetery.